Without the financial ability to deliver on benefit promises made to employees, local and state governments are changing the rules of the game. Faced with an adverse legal decision and skyrocketing benefits costs, Orange County, Calif., is pushing hard to reduce its pension and healthcare expenditures that have continued to rise, despite declining revenues, in recent years. Employees now share in the contributions to their pension plans, pick up more of their healthcare expenses and hold slim prospects for an increase in wages or even small adjustments to keep up with inflation. Instead, Danley says, he is bargaining with unions to find savings, so the county can manage its employee costs, particularly those for pensions and health care, and repay the state following a $150 million loss in a court case related to school funding. “Our pension and health care costs have increased dramatically,” he says. 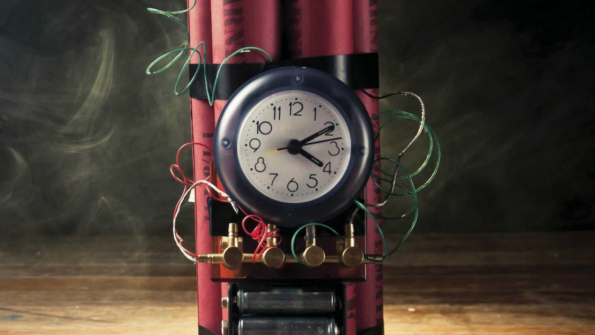 Governments of all sizes are taking a strategic view of their human resource operations to assess how they can fulfill their mission in an era when cutbacks in pensions, wages, benefits and personnel have fundamentally changed the workplace. New laws, court decisions and economics since the 2008 recession have combined to forge a new reality that is vastly different from the world of ample pension plans and rich healthcare benefits that were once the trademark of public sector employment. Now, governments seek innovations that will motivate their employees, control costs and keep them competitive in the hunt for the right people in an increasingly technical world. Carlsbad, Calif., did away with automatic step increases for years of service and placed the savings in a pool for merit increases. 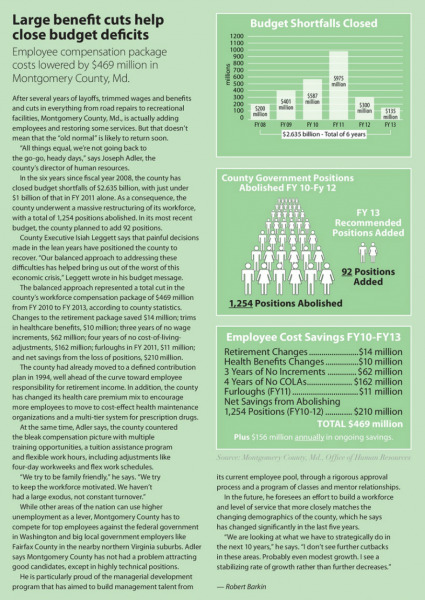 To see how large cuts to benifits helped reduce budget deficits in Montgomery County, Md., click the image on the right to expand. While the political argument remains heated in the background, local government officials are working every day to contain costs within budgets that are stretched thin, with little public appetite for tax increases or a reduction in essential services. 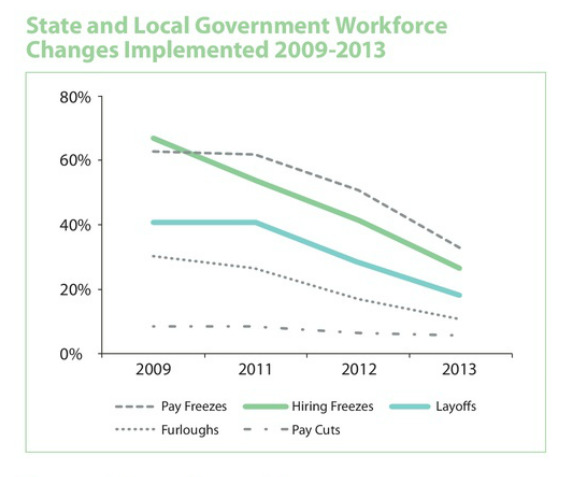 Local governments have lopped off 3.5 percent of the public sector workforce from peak employment in 2008. Governments employ about 6.3 million workers today, excluding education, according to SLGE and government statistics. In addition, SLGE found that the workforce has aged, from an average age of 40 in 1992 to 45 in 2012, as more workers decided against retiring during hard economic times. In its annual Workforce Trends survey, SLGE found that 60 percent of governments say their workforce is smaller today than in 2008. 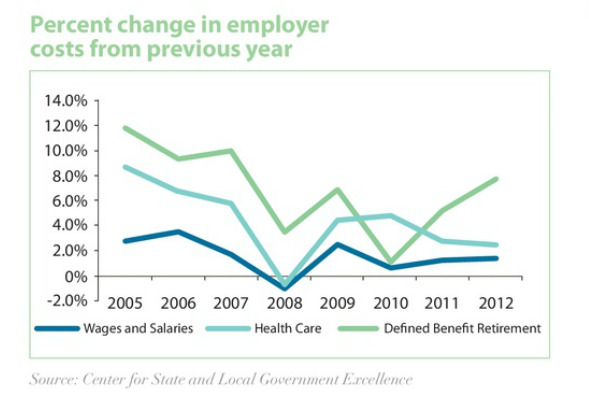 At the same time, local and state governments made significant changes to benefit programs in the years since the onset of the Great Recession, which exposed huge gaps between the promises that had been made to employees and the employers’ ability to fulfill them. The most obvious difficulties arose in the public sector pension system, which held $2.8 trillion in assets in 2012, covering 15 million working members (about 11 percent of the nation’s workforce) and provided regular benefits to 8 million annuitants, according to Alicia Munnell, director of the Center for Retirement Research (CRR) at Boston College. 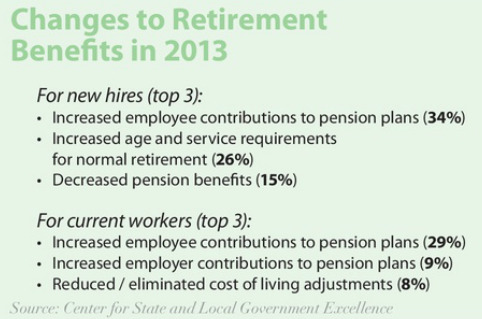 These changes have improved the prospects for state and local pension plans, according to Munnell’s statistics. It notes that the aggregated state and local plans should be back to a solid 80 percent funding by 2015, notwithstanding a crisis, such as a stock market crash.That aggregate ratio had fallen as low as 75 percent in 2011, according to CRR. While the overall picture has improved, the finances still vary widely from plan to plan, with 14 localities declaring bankruptcy in the past five years, often to shed their pension obligations, and plans in other entities with funding levels near 50 percent. Widespread cutbacks have also been seen in the area of health care, with 52 percent of employers in the SLGE study responding that they have shifted more health care costs from the employer to employee, in areas such as higher premiums, co-payments and deductibles. While health care inflation has slowed in the past two years compared to the regular increases of 8 to 10 percent several years ago, no one knows if those kinds of devastating hikes will return. In addition, certain provisions of the Affordable Care Act will penalize employers whose plans do not do enough to control costs. To read about the differences of opinion between unions and taxpayers, click the image on the right to expand. As a result, employers are trimming benefits, and those reductions are having a negative impact on the workforce in communities around the country, according to the SLGE survey. About 70 percent of the employers cited employee morale as an important issue for their organization. And the number of positions that employers say they have a hard time filling has grown, ranging from dispatchers and seasonal pool employees to attorneys, engineers and first responders, while the pace of retirements has accelerated in the last two years, after slowing down in the first years of the recession. Although Linn County, Iowa, does a good job of marketing itself as a desirable place to work, the county, like all governments, has to fight a generally negative perception about public service, says Supervisor Linda Langston, a Board of Supervisors member. Since governments can only offer small wage increases in the near future while more healthcare cost shifting is likely, officials try to be creative in improving the overall workplace, she says. “We do surveys, trying to see what are the best plans we can offer,” she says. In Rancho Cordova, Calif., outside Sacramento, the city of 67,000 residents has more contractors for its services (90) than it has full-time employees (68), says Stacy Peterson, the HR manager. “It gives us flexibility to reduce contracted services when development is down,” she says. The city has private companies maintaining roads as well as providing city planners and inspectors, she says. Many of the contract employees have served the city for five or even 10 years, but their employers handle all of their pay and benefits. Although much of the workforce is not employed by the city, it makes an effort to include contract workers in city planning task forces and community volunteer efforts. “We take extra steps to incorporate them with the workforce,” she says. At the Capital Metropolitan Transit Authority in Austin, Texas, the human resources department estimates that it has saved $4.5 million through its wellness programs. The programs were designed to control healthcare costs that were soaring 10 to 15 percent per year, says Michael Nyren, the agency’s risk manager. “It was threatening the overall operation of the agency,” he says. In Orange County, Danley says that the cuts have not diminished the supply of candidates for openings in the county, partly because the long driving distances in Southern California make the local job market especially attractive. “We’re still getting tons of applications,” he says.